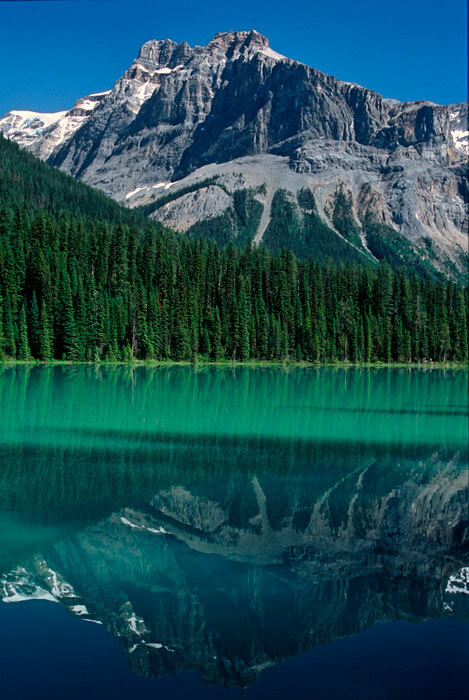 Located on the western side of the Canadian Rockies, Yoho National Park protects a wonderful mountain landscape full of towering peaks, thundering waterfalls, beautiful lakes, old growth forests, glaciers, and part of two ice fields. Yoho stands for awe or wonder in the language of the local native americans, who seemed to have a few things clear even in the long gone days of the late 1800s, when the park was established. What a beautiful name to have, quite difficult to improve. Little did they know at that time that 120 years later the park would be famous worldwide because of the only natural feature that their founders could not possibly have thought about. The barren slopes above the tree line in the center of the park are home to the Burgess Shale, one of the most productive and unique fossil sites in the world. It is here that the well preserved remains of thousands of maritime specimens from the Cambrian have been found, some even with their soft parts intact, making a huge impact on our understanding of the early stages of animal evolution. The Cambrian period occurred around 500 million years ago, long before the appearance of the supercontinent Pangea1, at a time when the world was covered by shallow seas and evolution entered into overdrive. It was a time when the small and simple marine animals that then existed had to evolve to eat or avoid being eaten, a time of trilobites (among the first arthopods), a time when the first primitive eye appeared, when improvements in locomotion and coordination took place, a time when evolution was making experiments, attempting to find the right way to move forward. So many new life forms appeared that the period is known as the Cambrian explosion, and most of that can be found on the slopes high over Emerald Lake2. Standing in the thin air of the mountains, surrounded by glaciers and with low temperatures even in mid summer, it is difficult to believe that the first animals of the phylum Chordata (those that have a nerve chord) were swimming or crawling here in the ocean several hundred million years ago, but that is indeed what happened. The photograph above was taken during a week-long trip to the Canadian Rockies in the summer of 2002. It was back then when I was starting to take photography more seriously, and was the first time that I shot slides to avoid developing the photos on the store and be in full control of the situation (what you shoot is what you get). I had just bought my first set of warming, polarizing, and neutral density filters, and was starting my long and probably still unfinished quest for the perfect tripod. I can only smile when I think about the clumsy tripod employed to take this image, full of redundant and flimsy knobs and bars. What makes this photograph special, apart from the total lack of wind that enables the reflection, is that shadows cover the foreground of the image darkening the reflection of the light snowy mountains, while the reflection of the much darker forest is sunlit (except at the bottom left), resulting in that fuzzy aqua color that occupies the middle of the image. 1As a matter of fact, during the Cambrian the previous supercontinent called Rodinia was starting to break apart into the continental fragments that would form Pangea some two hundred million years later. 2The main excavations into the Burgess Shale formation are located on the slopes east of the lake and do not appear on the image, which points north.